Are you just learning how to host webinars? Or want to step up your already strong webinar game? Check out our new webinar (54 minutes) where Zoom virtual event specialist Raul Montez and technical trainer and consultant Joshua Jones talk about the top 10 cringeworthy webinar mistakes and how you can avoid them to better your audience experience. Death by under-planning. Have you had a webinar where things just didn’t go right? A quick 30 minute planning meeting can help your hosts and organizers get on the same page, set expectations, and figure out the goals of the webinar. A planning meeting can also iron out any technical and hardware issues you may have. Zoom Video Webinar’s practice session feature is great for making sure that everyone involved in the session is connected early to hash out any last minute details. Attendees can’t see you. Although you don’t have to be on video throughout your webinar, it’s important that your attendees can see you to build trust and confidence. Even having your video turned on just in the introduction and conclusion of the webinar can greatly increase attendee engagement. Zoom’s excellent video quality will ensure that you’re always looking your best on camera! Your audience is lost. Research has shown that most peoples’ attention spans only range between 90 seconds and 10 minutes depending on the person and subject matter. When faced with large amounts of information to process, attendees can easily get lost. Avoid this by taking short breaks throughout your webinar to allow time for attendee questions and feedback. Pitching too hard. The quickest way to lose attendee interest is to talk about things that they didn’t sign up for. Although you can sprinkle some information about your products, especially if they relate to your webinar topic, it’s best to tread lightly with the sales talk unless that is the explicit topic of your webinar. Sometimes the best sales pitch can be a thought leadership or best practices webinar that gives your attendees useful information to walk away with. Didn’t hold that last, critical meeting. Congrats – you just finished your webinar! What now? Mastering webinars is a learning process. Having a post-webinar meeting with the participants and organizers can drastically improve your next webinar. Talk about what worked and celebrate your successes, but make sure to also address areas of improvement and identify possible solutions. Also don’t forget to follow up with your attendees quickly. Give them the webinar recording and a next step to follow. Strike while the iron is hot! 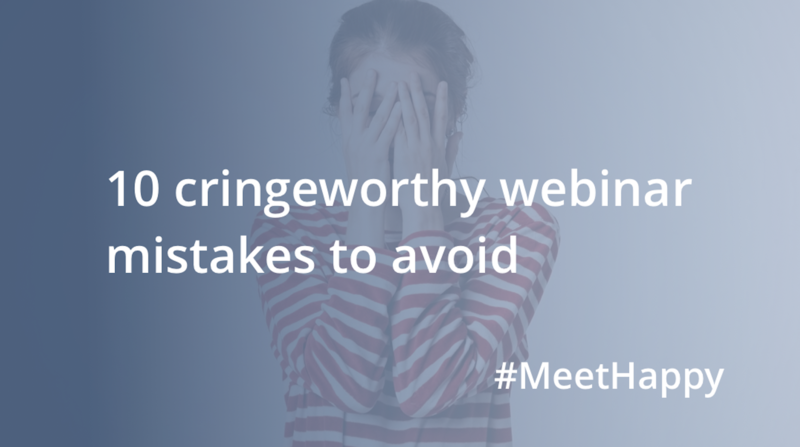 Want to hear the other five webinar mistakes and what you can do about them? Check out the full webinar recording. Learn about how to bring video webinars to your enterprise by signing up for a personalized 1-on-1 demo with a Zoom specialist today!